I think that pretty much sums up my feelings about chocolate. I. Cannot. Live. Without. It. Since Passover chocolates are often gross, and the desserts are never up to par, I am attempting to make a Passover chocolate ice cream that hits the spot. The funny thing about ice cream is that it is the only dessert (except for fruit, but remember, that doesn’t count as a dessert in my book!) that does not need to be altered much, if at all, to make it kosher for Passover. So, all I had to do was go out and buy dairy products that are kosher for Passover and special marshmallow fluff and blend away. No big deal. 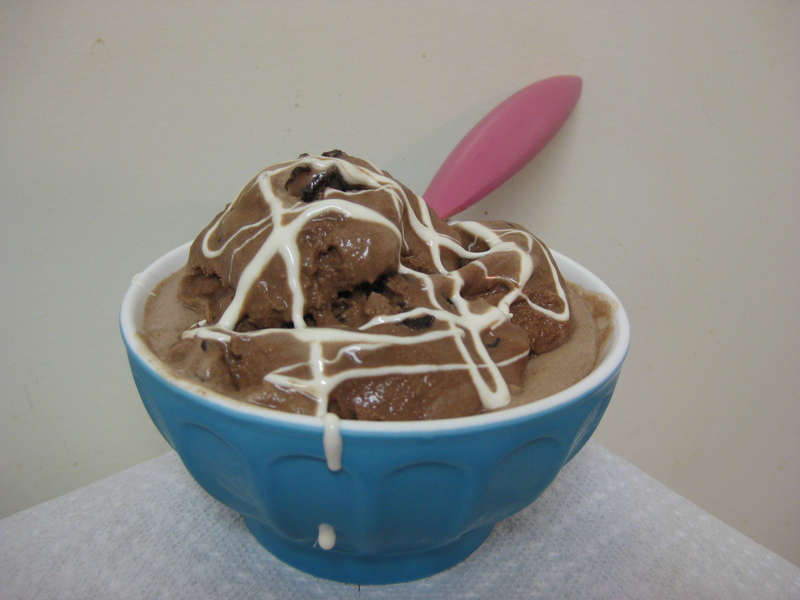 Chocolate ice cream is, simply put, delicious. There’s a reason that it’s the second most popular ice cream flavor. Just see this site . So if chocolate ice cream is that good, imagine how yummy it could be with fluff and fudge chunks? Pretty damn amazing. 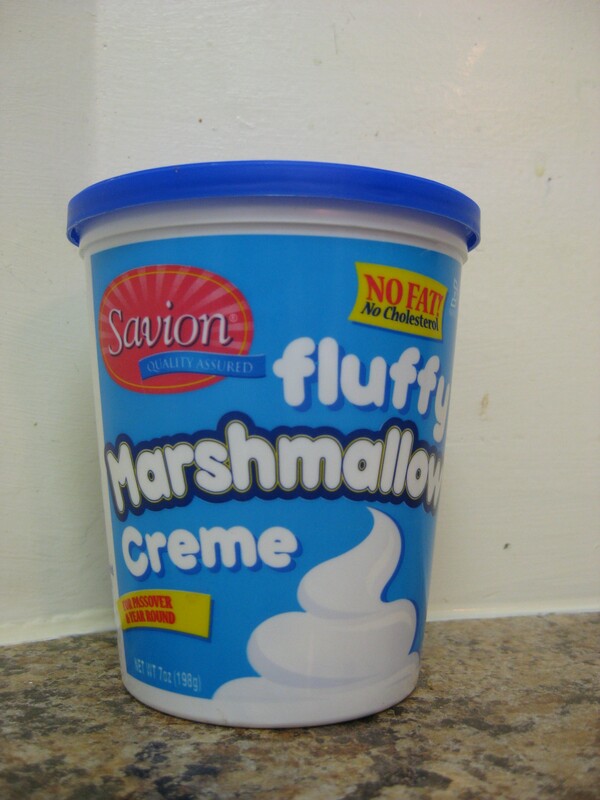 I set out on a quest to find kosher for passover fluff and managed to pay a whopping $5.29 at an over priced store (regular fluff is $2.39, ugg). I figured that the ice cream wouldn’t be the same without it, and despite the price, took the plunge. It was very easy to find all the kosher for passover milks, sugars, and chocolate. Armed with the goodies I headed home to whip up this treat. When I first got the ice cream maker (insert romantic music here), I knew it was love at first sight! I could hardly wait to open the box and see the shiny new, beautifully blue machine, but since I had to schlep it home on the cross town bus first, I decided to read the instruction manual and recipe booklet while on the bus. The very first recipe I saw was S’mores Ice Cream. I knew this would have to be one of my first concoctions. I dog-eared the page in hopes of coming back to it very soon. Well, today was that very day. I made a few adaptations to make this recipe kosher for passover (i.e. no graham cracker crumbs) and slightly less fat (used half-and-half instead of heavy cream) but everything else remained the same. Here is the recipe, I hope you enjoy it as much as we did. In a medium bowl, whisk together the cocoa, sugars and salt (it’s slightly hard to mix at first since the chocolate doesn’t dissolve so quickly). Add the milk and, using a hand mixer on low speed (caution: the chocolate powder flew everywhere! 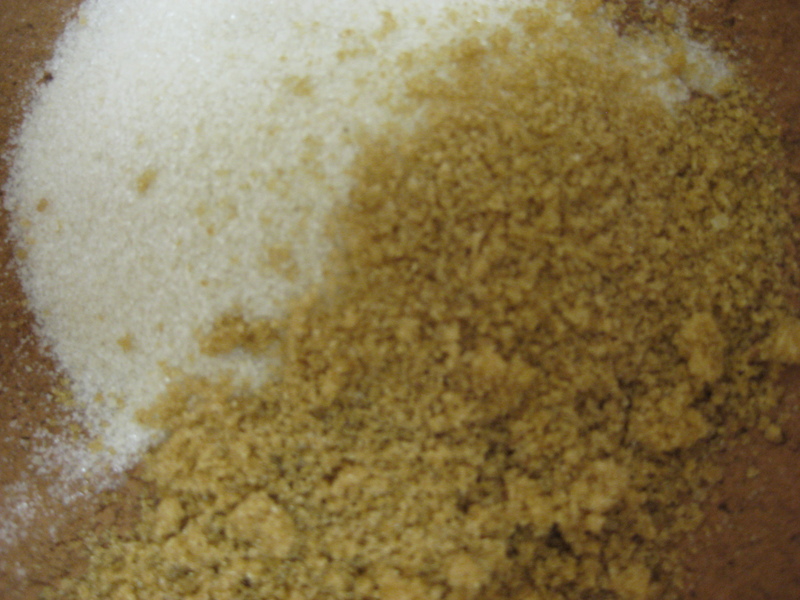 ), beat to combine until the cocoa and sugars are dissolved. Stir in the heavy cream and vanilla. Cover and refrigerate 2 hours. Turn on the ice cream maker, pour the mixture into the frozen freezer bowl and let mix until thicketed, about 20-22 minutes. Approximately 2 minutes before mixing is completed, gradually add the marshmallow cream, one spoonful at a time. Once mixed (mine mixed in almost entirely, so next time I will drizzle fluff into the chocolate ice cream once its done churning so it does not get completely absorbed into the ice cream) add the melted chocolate one spoonful at a time. The chocolate will freeze as soon as it hits the machine and turn into various sized fudge chips. 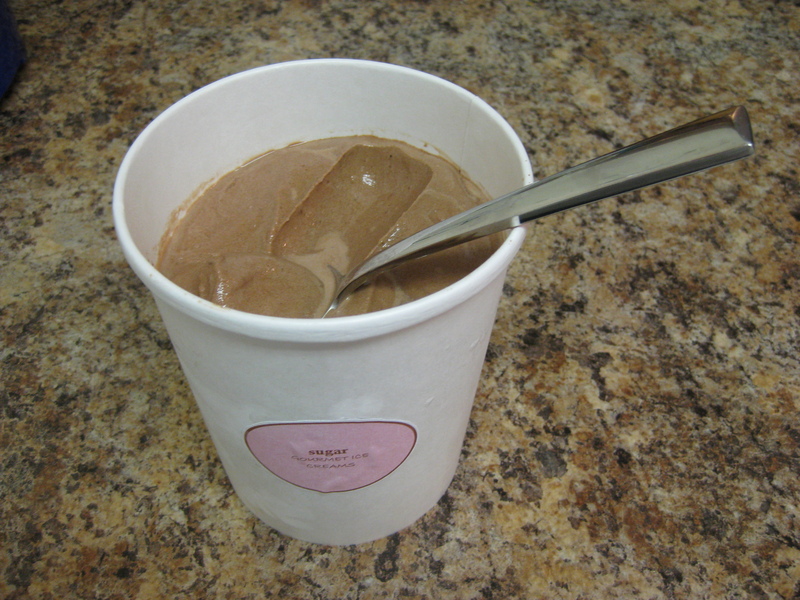 Once finished the ice cream will have a soft, creamy texture. This one was particularly soft and creamy due to the passover marshmallow fluff so I would certainly recommend freezing it in an air tight container for a few hours or overnight. Me: Deliciously creamy, perfectly chocolate-y, all around good! **Note: I tried this ice cream again for breakfast (can you blame me?) after it had frozen entirely over night. It was very creamy and delicious, tasted even better the next day. But, worth noting that the marshmallow was almost mixed entirely into the dessert, and even though you could taste the fluff, it was hard to see. The Passover fluff made the ice cream so uber-creamy that it can’t stay out of the freezer for very long before consumption. Bottom line: eat it ASAP! I’ll have to make it later today :D it look so good!